GET 2 PET TRAINING COLLARS: Since we know that pets are too lovable not to have multiple, our dog training kit includes not one ... but TWO dog shock collars for small dogs and large ones. 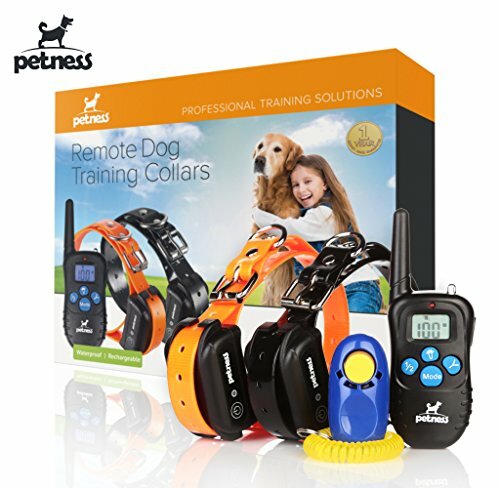 EASY TO USE TRAINING COLLAR REMOTE : The dog training remote is perfectly compatible with two pet training collars for dogs.Really easy to switch modes now! ADJUSTABLE AND WATERPROOF : The e-collar for dogs waterproof is recommended for dogs 15 lbs or larger, and it is adjustable from 7"-26" neck size. 3 METAL PROBES NOW: These small dog training shock collars waterproof feature 3 metal probes that produce a gentle shock in order to securely and in effective way train your pups. IMPROVED MICROCHIPS & BATTERIES : We have outfitted pet training collars for dogs and remote dog training collar with improved microchips and powerful 500mAh rechargeable lithium batteries. No other large small shock trainer for small dog devices electronic dares to compare! No more inconvenience for pet owners with our dog shock collars for small dogs and large ones! You ask why? It’s very easy. Our pet training collar kit gives everything you need to train two dogs to be obedient and well behaved. Have you ever wondered which small dog shock collar you should use? Well, we proudly specialize in providing the most effective pet training collars for dogs that are preferred among pet owners all around the country! Unlike other dog training shock collar waterproof and large small shock trainer gadgets that are mostly ineffective, quite dangerous and rather difficult to use, our dog training collar and the remote that comes with them are safe and easy to use and 100 % waterproof. – Fits Perfectly Dogs Larger Than 15 lbs. As you can see, not so many remote pet collars for dogs can compare to ours. Since the training dog collars are adjustable, they can be used as dog shock training collar for all types of dogs. The small dog shock training collars are equipped with 3 metal probes that have been designed to penetrate all sizes of pet hair. Use them on breed such as the Shih Tzu, terriers, schnauzers, spaniels and retrievers or use them on breeds with shorter hair like the shepherds, pitbulls, hounds and beagles. Scroll up click ‘ADD TO CART’ to order your Dog Shock Collar with remote now!